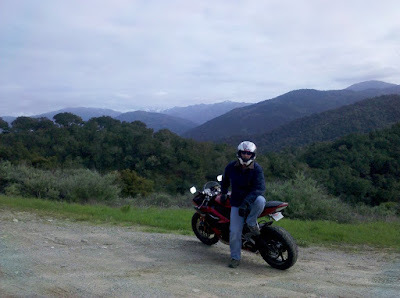 Well, Sunday the sun finally came out and Roberta and I snuck off for a nice ride down through Carmel Valley. We stopped off in Carmel Valley Village for lunch, but since the whole region was in the midst of a power outage we ended up eating a picnic style lunch made of chips, soda’s, and sandwiches from the local gas station. It was actually kind of nice. Then we continued on another 12 miles or so through some really pretty winding hills. Finally turning up Tassajara road. Where this picture was taken. We found an interesting little General store next to a Trailer Park/Town called Cachugua. I swear I heard banjos playing in the wind. Nice old guy sitting on the porch of the store. People wandered in and out and everyone seemed to know each other. 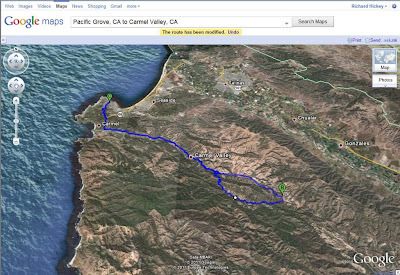 We continued on up throught the hills and back toward Carmel Valley Village. Up and the top we took these pictures with Roberta’s now broken Droid phone. All in all it was about 65 miles round trip. 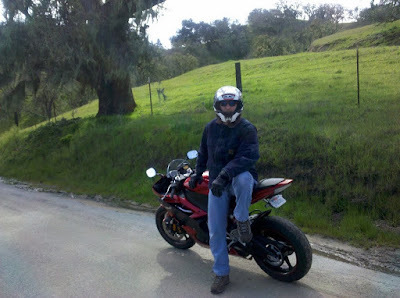 A real nice day for a ride and a lot of fun for our first biking adventure.